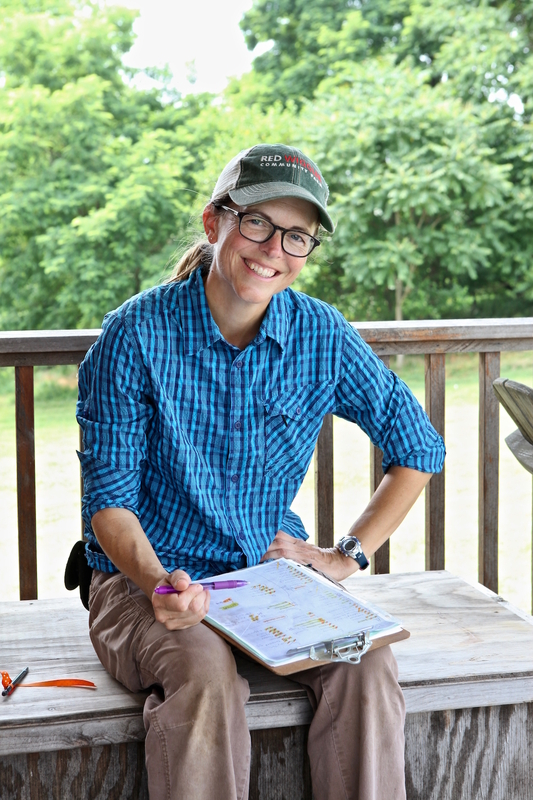 In her role as Farm Manager, Melissa keeps track of all the daily work needed to keep the farm on schedule, and assigns tasks based on abilities, skills, and experience. Though she grew up on a homestead farm, learning all the skills for growing 30,000 - 40,000 lbs of vegetables each year has been a huge education. Melissa is the keeper of maps for planting and worksheets for yields. You might think she spends all her time with pivot-tables, but you're just as likely to find her in the fields taking photo "field notes" or leading impromptu research on a new insect. Melissa joined Red Wiggler Community Farm in 2015 as the Field and Facilities Manager. Prior to Red Wiggler, she pursued many interests from theater to microbiology, biotech to computer-aided drafting. As a lifelong learner, she's currently taking graduate courses at Hood College in Environmental Biology and GIS mapping. Melissa also volunteers with Frederick County 4H Therapeutic Riding Program, mostly as a photographer and communications support volunteer.